As a young attorney, I get the kind of experience here that I wouldn’t get elsewhere. After 13 years working as a reporter, Aaron Saykin decided to pursue his true passion, the practice of law. 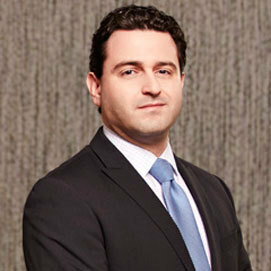 Now an associate in Hodgson Russ’s Business Litigation Practice, Aaron found a narrower, but in his opinion, even more critical audience―in the courtroom. As an associate, I report to a number of partners within the practice area of litigation. I contribute whatever is needed at the time and for the matter. I assist partners in a variety of capacities, like research and document preparation. If the case involves a large, sophisticated matter requiring a higher level of manpower, I’m a member of a bigger team, segmented according to legal specialty. Sometimes I am given more responsibility and am allowed to work directly with the client. As a young attorney, I get the kind of experience here that I wouldn’t get elsewhere. I feel my job is the perfect balance of hands-on and support. What are some of the accomplishments you are most proud of during your time with the firm? On a professional and a personal level, I feel very fortunate to be working here, to have landed a position in what I consider one of the most sought-after firms. We go toe-to-toe with the biggest and best in the country and work on very sophisticated, complex cases. If you want to be a great lawyer, you must have the opportunity to do work at this level. Every day I am tremendously humbled and appreciative. Our [headquarters] building, the Guaranty Building, is symbolic of all that the firm is. It’s so breathtaking, it inspires me every day when I walk through the door. What’s important to you in choosing your place of work? When I finally gave in to a lifelong dream of becoming a lawyer, I knew I wanted to be a great one. I wanted to enjoy the people I work with and look forward to coming to work, but I also wanted to work on a variety of matters, and to be challenged, and to learn. At Hodgson Russ, I work with smart and talented individuals who could have had their pick of places to work anywhere in the country. But it’s more than that. The firm puts a premium on bringing in interesting people from all different backgrounds. That makes the environment stimulating and motivating. Hodgson Russ was built on the shoulders of wonderful – even famous – attorneys, and we have a tremendous appreciation for our traditions and our venerable history. But it’s not your grandfather’s stodgy old firm. More than anywhere else I have ever worked, it’s an open, dynamic place, filled with an energy that you don’t expect, much less find, in a lot of law firms. The people are interesting and great to work with, and the atmosphere is open and relaxed. It’s clear that we are passionate about what we do, and I believe it’s something that affects our clients as well. I think they feel it in our interactions and it translates into results.